Three Pipe Problem: The search for Leonardo's Anghiari comes to an end? The search for Leonardo's Anghiari comes to an end? The search for the Leonardo fresco fragment, commonly called The Battle of Anghiari - has captured the world's imagination. News reports, documentaries and online articles have provided updates on the progress of the search - with a focus on the controversies of Italian cultural politics and the romanticised battle Professor Maurizio Seracini has fought against the Italian art establishment for over 30 years. The search for the Battle of Anghiari is over. In the Salone dei 500, the holes are being filled in Vasari’s fresco. Soon, the scaffolding will be removed, the cost of which was about to pass to the City of Florence. The technicians of the Opificio delle pietre dure are filling in and restoring the 6 holes in the surface of Vasari’s Battle of Scannagallo in the Salone dei Cinquecento of Palazzo Vecchio. They will probably be finished by next week and will then begin to dismantle the massive scaffolding, which until now was paid for by National Geographic but would soon become the responsibility of the city of Florence. 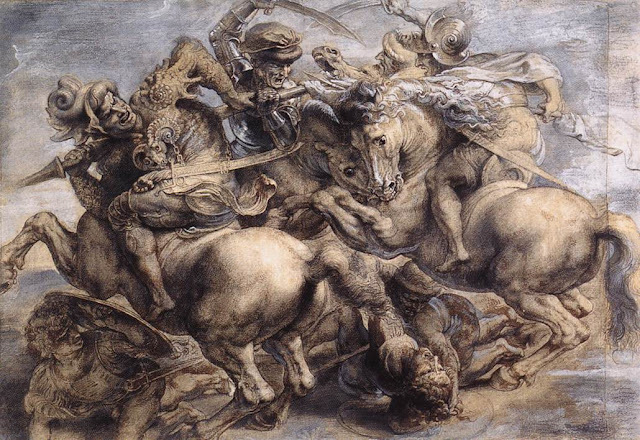 This is how it ends, with strokes of stucco and paint, the search for the Battle of Anghiari, Leonardo’s mythical work. Matteo Renzi described this as “the great mystery story of the Renaissance” and it was supposed to be solved by engineer Maurizio Seracini, professor at the University of San Diego, and his group. With endoscopic soundings, they were to have passed through the wall on which Vasari’s fresco is painted, discovering a second wall where, according to him, were traces of the brush strokes of the genius from Vinci. Cristina Acidini gave the go ahead to fill in the holes a few days ago, apparently after a meeting with Lorenzo Ornaghi, the Minister of Cultural Properties. The Opificio will need only a few days to conclude the work, seeing that the opportunity has lapsed for restoring the Vasari, as was hypothesized when Seracini’s group started their operation. A couple of estimates were in fact made, more than 100,000 euros for a full reordering , much less for a simpler intervention. The fresco will thus remain as it is now. It was Matteo Renzi, back in July, who said in a highly polemical letter to Ornaghi that it no longer made sense to carry on. The mayor was attacking the minister, saying that it wasn’t enough to take further samples behind the six extant holes because they had already arrived at “an historic result, a mile stone” , discovering traces of paint that could go back to Leonardo. Rather, it was necessary to pass through other holes, in areas of the fresco restored in the nineteenth century. Last May, in effect, it was announced to the world in a crowded press conference right below the scaffolding that Seracini’s work had revealed important indications that led back to Leonardo. The problem, however, is that the samples taken by the professor and analyzed in his laboratory and in a private establishment were never sent to the Opificio and to the Soprintendenza for counter analysis , although this had been requested. In fact, the technicians of these two entities [the Opificio and the Soprintendenza] never even received a detailed report on what had been discovered. What they know is what they saw in the slides used for the presentation to the press. After the minister’s visit to Florence, the Soprintendenza proposed taking new samples from the six holes (plus a seventh) in order to confirm what had been stated by Seracini and to make further clarifications. In his July letter, Renzi explained that the work was already done and that his administration didn’t want to play “the delaying game”. Now, the Soprintendenza has given the go ahead to close up the holes. In the coming days, the worksite will be shut down and the City is in a hurry to do this because it doesn’t want to pay for the scaffolding. The search for the Battle of Anghiari began in November of 2011. Polemics immediately broke out and an official of the Opificio, Cecilia Frosinini, disassociated herself from the intervention. The collection of signatures was begun by a group of experts and art historians from all the countries of the world who denounced the risk of damages to the Vasari, although the state magistrate in Florence found that damage had not in fact been done, and then there were general doubts that the Leonardo was actually to be found there. In March, after Seracini had concluded his initial work, it seemed that Palazzo Vecchio was the scene of one of the most important art historical discoveries of recent years. However, those who enter the Salone dei Cinquecento after the next few days will not be aware of any of this. This development is perhaps sadly anticlimactic, but does not seem to be altogether surprising. The key items of information appear to be that Professor Seracini's quest was only made possible by ongoing sponsorship by National Geographic. A communication breakdown between Seracini's team and the official entity responsible for the site, the Opifico delle Pietre Dure (OPD) has stalled the investigation - which at this point seems irreconcilable, with National Geographic also having ceased their involvement. In an age where transparency of reporting, peer review and collaboration seem to be the golden standard for those engaged in any type of research, achieving this in reality always proves a lot more difficult. 3PP would like to thank Dr. Edward Goldberg for the prompt translation and ongoing insight into the tumult of Italian cultural affairs viewed from Florence. Well, it has been an adventure and I cannot imagine that it is over yet! Anghiari is going to keep coming back to haunt us, until someone drives a stake through its heart or shoots it with a silver bullet (making more holes, I fear). Even by Italian standards,this little exercise has been remarkable for its clash of personal agendas, lack of transparency and public posturing--with very few facts to cramp anyone's style! Hello Ed - if I may put on my "science" hat (or is it lab coat?) for a moment, I would hope that it is clear for all observing/reading that this development is neither the "end" of the investigation nor a victory for those opposed to its concept or implementation, such as the melodrama infused Save Vasari crowd. An investigation is only ever concluded when sufficient data has been gathered and analysed to answer the questions at hand - in this case - did Leonardo paint his fresco on that spot, and if so, what of it remains? We have a stronger idea of the former, but a sketchy account of the latter. In both cases, the amassed evidence was never entirely conclusive. Hence, the investigation is not over, just simply abandoned according to the current study design. Michele Bocci's "unsolved" is of course apt. We can only wonder how much NatGeo put into the venture and whether they may have been better off putting $250,000 USD into the kickstarter project that promised to deliver a non invasive methods of testing the target surface for organic compounds seen in pigments and preparatory materials used in such paintings. Seracini's failure to either publish or share his technical data doomed this project. Politics didn't help. It's disappointing but predictable that the Vasari fresco will remain unrestored, to boot. Hasan--As you say, the search for truth in this matter is far from over (nor is the noise and silliness). And it was definitely not a victory for the overwrought (and often self-promoting) "Save the Vasari" forces--which included a number of people who should have known better and others who were no better than they ought to be. They got slapped down quite hard by the Procura--the ultimate legal authority in Florence--which ruled their charges of damage to national property to be unfounded. The Vasari was never in any real danger, thanks to Cristina Acidini and the Soprintendenza, which took all of the necessary administrative steps to safeguard it. (Italy being Italy, these "administrative steps" involved some backstage maneuvering between Florence and Rome and we will never quite know who did what to whom). Ultimately, it was National Geographic that cast the deciding vote by pulling their funding, once it became clear that Maurizio Seracini was being less than candid regarding the facts of the matter--and even more decisively, was unable to perform his tricks within their docudrama news cycle. So, "The Discovery of the Lost Leonardo" ceased to be a marketable product for them. Meanwhile, Mayor Matteo Renzi lost interest in the Ghost of Leonardo (along with everything else in Florence; he is now focusing his notably short attention span on national office, with the hope of eventually becoming prime minister.) I like to think that a serious scientific investigation can now take place in an atmosphere of objective calm--which would involve putting together a new research plan, finding funding, rebuilding the damned scaffolding, etc. But, "objective calm"? Who am I kidding? Meanwhile, as many wise heads have observed, "The tantalizing mystery of a lost Leonardo is worth far more than proof that no such thing exists"! To take another and provocative tack, I suppose it is too late to argue that Vasari was a third-rate painter anyway, especially in fresco? Yes, yes, I know: it's all part of the history of the building -- but, personally, I wish someone would take up the cause of finding ways to cover the Vasari mash-up on the interior cupola of Santa Maria del Fiore, to at least experiment with restoring the sense of a soaring cupola 'heaven' which was so diminished by the Vasari-Duke Cosimo axis of pomposity. Well, good, that's now off my chest! Thanks for the news, 3PP. Art, egoes, politics, and money. What a great play this story would make! @Ed - yes, it seems the many different players at the table had different agendas, which at one point happened include a research question involving an early 16th century fresco in the Palazzo Vecchio! @Andrew - I am glad that is off your chest (!) though you will not find to many who will disagree - Vasari's work has not had the enduring appeal he may have hoped it would have. His legacy is a fascinating one, but not necessarily one based on marveling at the invenzione in his painting/design. Thanks for covering the story for an English-speaking audience! What a sad ending to this quest. Who knows, though: as others have said, this story might not be over yet! It is my belief that we curently do not possess the technology to see behind the Vasari mural yet. Eventually something will be designed whether it be Ultraviolet, Infrared, Xray or something not yet thought about that will give us the answers we seek here. I do feel as if I'm cheering for my home football team on this one against a foe that rarely loses ..... knowing in my head that it is a long shot that the Da Vinci is there and hoping in my heart that it really is there. I don't know if anyone has ever thought of coming in from behind the mural at some optimum vantage point. I'm not sure what is behind there structurally, but maybe there is a spot that could work out. It would possibly help confirm that there is actually another painting behind the Vasari. Great job as usual on this story! Actually, the technology to find the painting exists and has been tested. See _Argonne Now_ Summer 2012.